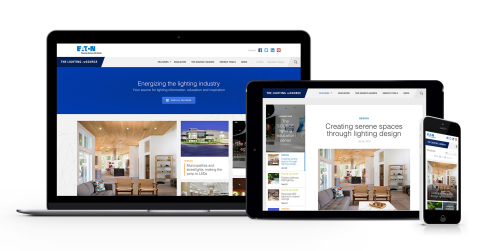 PEACHTREE CITY, Ga.--(BUSINESS WIRE)--Power management company Eaton, a 2015 ENERGY STAR® Partner of the Year, today announced the launch of The Lighting reSOURCE (http://TheLightingreSOURCE.eaton.com), a 24/7 online hub providing lighting industry professionals from veteran to novice with information, news and original content designed to inspire and educate. To explore The Lighting reSOURCE, visit http://TheLightingreSOURCE.eaton.com. For more information on Eaton’s lighting and controls solutions, visit www.eaton.com/lighting.